Before harvesting broccoli, you'll need to make sure it has reached its peak size and texture. Hopefully your broccoli plants are large and lush and have begun to produced some good-sized heads. 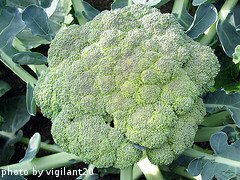 When you see the head beginning to form in the center of the broccoli plant, you'll need to closely monitor it's growth. Check it often to make sure the tiny buds that make up the head remain tightly closed. If the head resembles a miniature rolling meadow or cloud, you're in good shape. If the head is spindly and looks like a chunk of sea coral, it is past its prime. Once the buds begin to swell up or you see some yellow peaking out from under the buds, harvested the head immediately, regardless of its size. 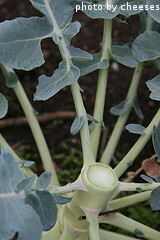 When the buds open up, the broccoli will be mealy or grainy. The idea is to harvest broccoli when the head is as large as possible, but before the head is too mature and the buds open up. Most of the time, the broccoli you grow will produce a head somewhat smaller than those you might find in the grocery store. When harvesting broccoli, you'll need a sharp knife. Cut the head at its base. Leave the plant undisturbed in the ground after cutting off the head. It will produce smaller side shoots. These can also be harvested and eaten. Again, keep a close watch on these smaller heads. Once the buds begin to swell up, harvest them right away, regardless of size. After you've harvested the main head and side shoots, the plant can be pulled up by the roots and added to your compost pile. The harvested broccoli can be eaten right away. It will also keep for about a week in the refrigerator. Broccoli stores best in the refrigerator if the heads are left intact. If you have a large broccoli crop, a great way to preserve it is by freezing it. Cut the florets off of the head. Blanch them in boiling water for 2 minutes and then plunge them into an ice water bath for 2 minutes to stop the cooking process. The florets can then be drained and placed in an airtight bag or container. Store the container in the freezer. The broccoli will keep well in the freezer for up to 6 months. 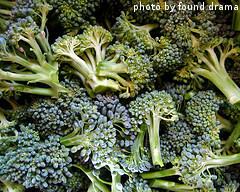 Now that you're done harvesting broccoli, it's time for a few of our favorite broccoli recipes.